Top 20 Icebreakers | I Want to Witness, But What Do I Say? I Want to Witness, But What Do I Say? Ex-Gay Testimonies – God Loves You! 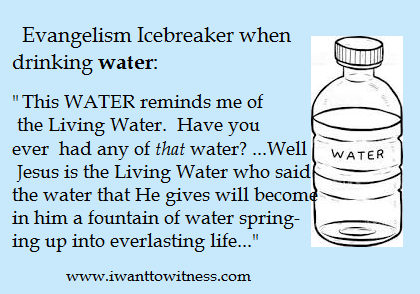 Do You Need a Prophetic Word? 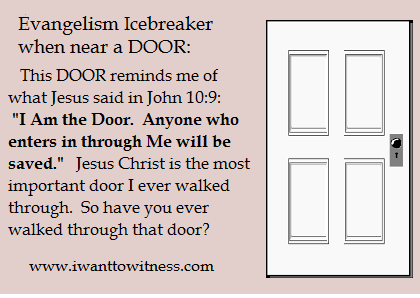 Door – That door reminds me of the most importatn door that I ever walked through His name is Jesus Christ. He is the door to eternal life in heaven. 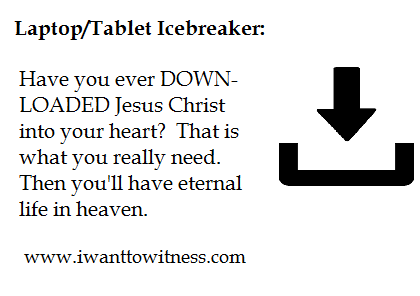 Download – Speaking of downloads, have you ever downloaded Jesus Christ into your heart? That is what you really need. Though praying to receive Jesus as Lord, you can have eternal life in heaven. Golf Tee– As I drive this golf tee in, it reminds me of the nails that were driven into Jesus’ hands and feet on the cross. That one act shows how much He truly loves us because He willingly shed His blood and died on the cross for the sins of you and me, so that those that believe in Him could be reconciled to God and have eternal life in heaven….Have you ever prayed to receive Jesus as your Lord and Savior? Home Improvement – Taking my family to church every Sunday is the best “home improvement” that I ever made. As we all learn to forgive each other and embrace Christ’s love and the joy and peace of God, my home life has greatly improved …Does your family go to church? Lilies – Those lilies on remind me of that verse in Song of Solomon 2:1 that says that Jesus Christ is the lily of the valley. He is the bright spot during hard trials when we feel like we are in a valley. Lilies also surround the altar at Easter-time to celebrate the Resurrection of Jesus Christ. Movie Ticket – My ticket reminds me of salvation through Jesus Christ which is my ticket to heaven. That’s the place I want to see and be for all eternity. The best part is – it is a free ticket, or a free gift. 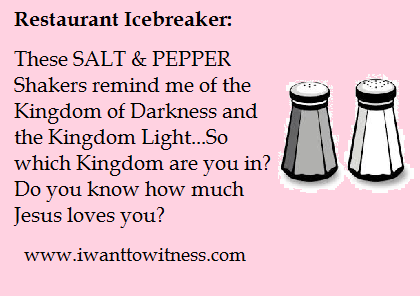 Salt & Pepper shakers – These salt and pepper shakers remind me of the Kingdom of Light and the Kingdom of darkness…So do you know which Kingdom you are in? Special Delivery: This package that is being sent “special delivery” reminds me of how Jesus Christ was born into the earth. He came special delivery. The Holy Spirit overshadowed the virgin Mary causing her to miraculously conceive Him. He was born in a manger and later died for the sins of the world. Whoever believes and receives Jesus Christ as their Lord will have eternal life…So do you believe in Him? 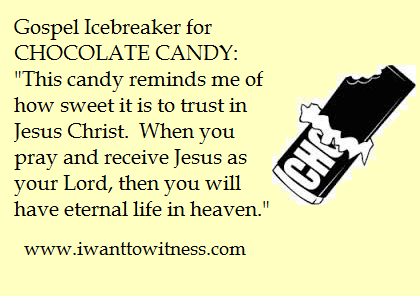 Sugar – This sugar reminds me of how sweet it is to trust in Jesus… The Bible says in Psalm 34:8 – “Oh taste and see that the Lord is good; Blessed is the man who trusts in Him.” I’m so thankful that God loves me… Have you ever put your trust in Jesus? Sunglasses – When I buy sunglasses, I get the rose-colored lenses because it reminds me of my righteousness. Since I received Jesus Christ as my Lord, God does not see my sins, but He sees me through rose-colored glasses that are stained rose by the blood of His Son Jesus Christ. I’m so thankful that God loves me. He loves you too…Would you like to receive Jesus as your Lord? Three Strikes: I’m so glad that the “three strikes and you’re out” rule only applies to baseball. God is much more merciful than that. It says in 1 John 1:9 that when we confess our sins, God is faithful and just to forgive us of all of our sins and cleanse us from all unrighteousness …So is Jesus your Lord? Turnover: (If it was to your team’s advantage) Did you see that great turnover?! We have the ball now! 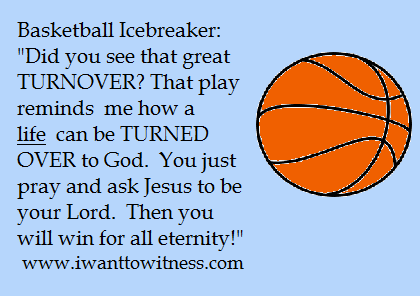 That play reminds me of how a life can be turned over to God. All you have to do is repent and pray to receive Jesus Christ as your Lord and Savior. Then you will win in heaven for all eternity….So would you like to pray to turn your life over to Jesus Christ? Under the Hood – As I look under the hood of this car, it reminds me of how God can look under my outer appearance and look straight into my heart. He wants to repair the brokenness, remove the devil’s lies, and get me up and running again…Have you ever prayed to receive Jesus as your Lord? Waiting in Line – This line is taking so long, it reminds me of eternity. Actually eternity is a whole lot longer than this line! It lasts forever. It is a very long time to be spent in the wrong place…Do you know where you will spend eternity? Have you ever received Jesus as your Lord? 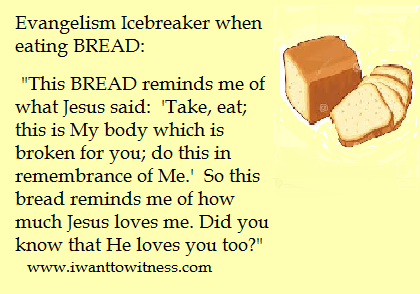 Susan has led many people to the Lord through these icebreakers and being led by the spirit. 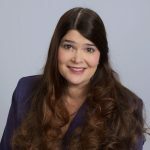 She prophesies through song; is an intercessor for those in third world countries to be saved; is a full-time prayer partner at the Abundant Life Prayer Group at Oral Roberts Ministries and is married to David Nazarewicz.